On every body positions we do on patient when performing barium enema studies, the air-barium distribution within the stomach and large intestine changes. 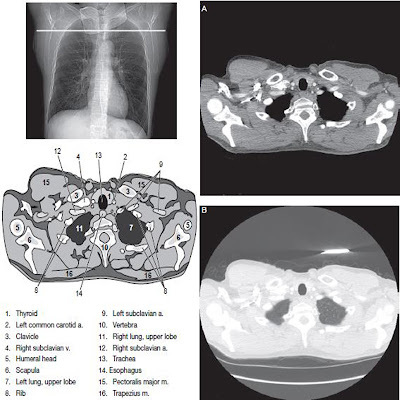 By knowing these distribution patterns, one can determine in which body position a radiograph was taken. Air always rises to the highest levels, and the heavy barium settles to the lowest levels. The air is black on the radiograph and barium contrast appears white. When we position the patient in supine and shoot to make the radiograph, the barium would be in the lowest portion of the stomach because the fundus is located more posteriorly. In both prone and erect positions, the fundus would be filled with air as seen on the picture below, with a straight air-barium line on the erect. (barium in body and pylorus). The ascending and descending portions of the large intestine are located more posteriorly, and thus more of these parts in general would be filled with barium (white on the radiograph) in the supine position and with air (black) in the prone position. An enhance and much separation of barium and air occurs generally only with double contrast barium air studies. Air fluid levels would be seen in the erect position in which the air would rise to the highest position in each of the various sections of the large intestine, as shown on the picture below. Right and left decubitus projections also would demonstrate air fluid levels, with air again rising to the highest portion of the intestines.